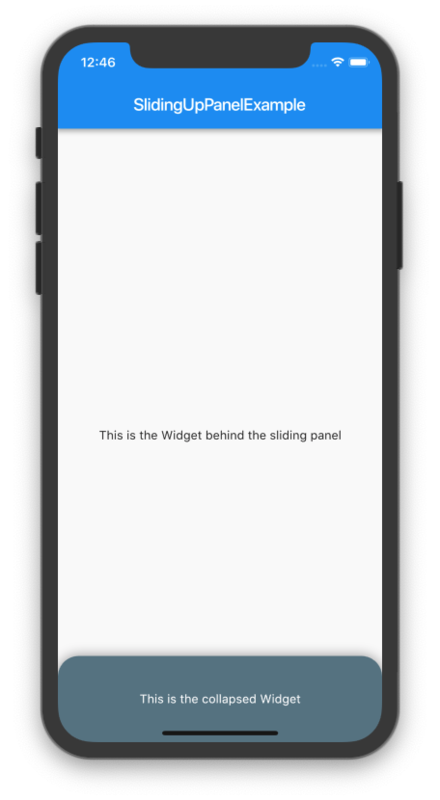 A draggable Flutter widget that makes implementing a SlidingUpPanel much easier! 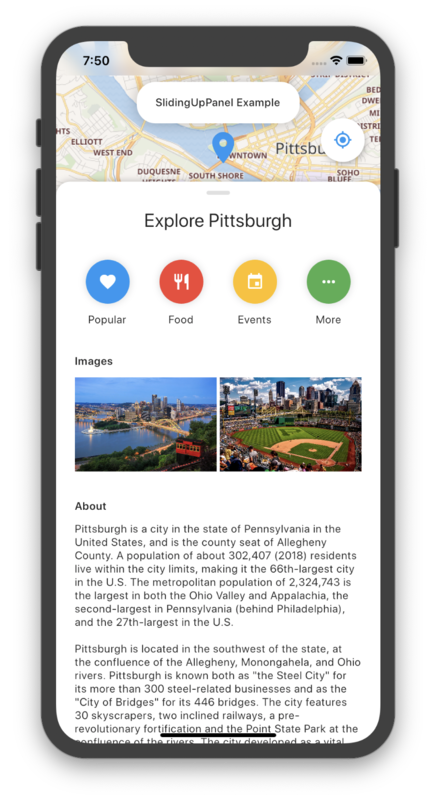 Based on the Material Design bottom sheet component, this widget works on both Android & iOS. There are two ways which the SlidingUpPanel can easily be added to your project. 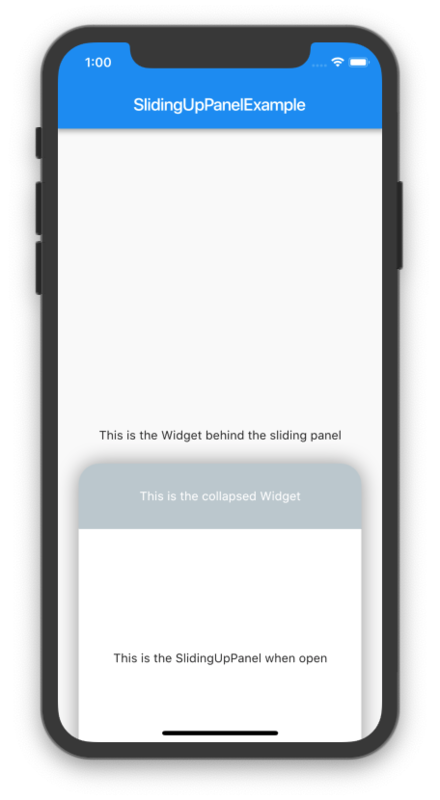 Using the SlidingUpPanel as the root widget for the body (recommended). This method isn't recommended but can still be used. Only use this to avoid refactoring large chunks of code or to implement custom scrolling behavior. For example, the SlidingUpPanel can be nested inside of a Stack (note that there are many other possible implementations that vary on a case-by-case basis). panel (required) The Widget that slides into view. When the panel is collapsed and if collapsed is null, then top portion of this Widget will be displayed; otherwise, collapsed will be displayed overtop of this Widget. collapsed The Widget displayed overtop the panel when collapsed. This fades out as the panel is opened. body The Widget that lies underneath the sliding panel. This Widget automatically sizes itself to fill the screen. minHeight The height of the sliding panel when fully collapsed. maxHeight The height of the sliding panel when fully open. border A border to draw around the sliding panel sheet. borderRadius If non-null, the corners of the sliding panel sheet are rounded by this. boxShadow A list of shadows cast behind the sliding panel sheet. color The color to fill the background of the sliding panel sheet. padding The amount to inset the children of the sliding panel sheet. margin Empty space surrounding the sliding panel sheet. renderPanelSheet Set to false to not to render the sheet the panel sits upon. This means that only body, collapsed, and the panel Widgets will be rendered. Set this to false if you want to achieve a floating effect or want more customization over how the sliding panel looks like. panelSnapping Set to false to disable the panel from snapping open or closed. 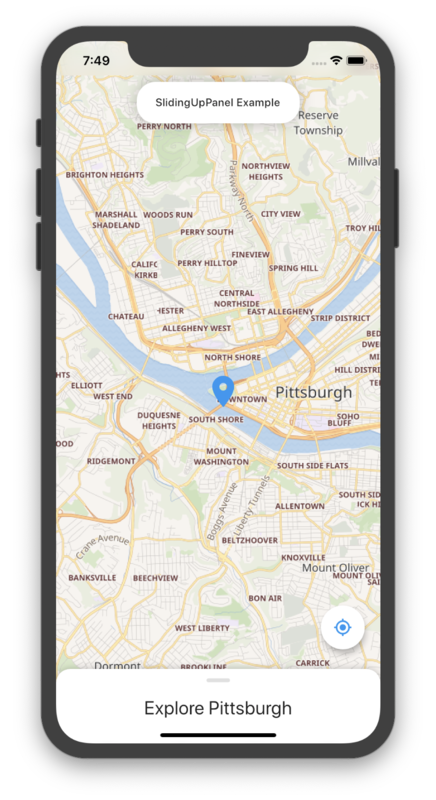 backdropEnabled If non-null, shows a darkening shadow over the body as the panel slides open. backdropColor Shows a darkening shadow of this Color over the body as the panel slides open. backdropOpacity The opacity of the backdrop when the panel is fully open. This value can range from 0.0 to 1.0 where 0.0 is completely transparent and 1.0 is completely opaque. 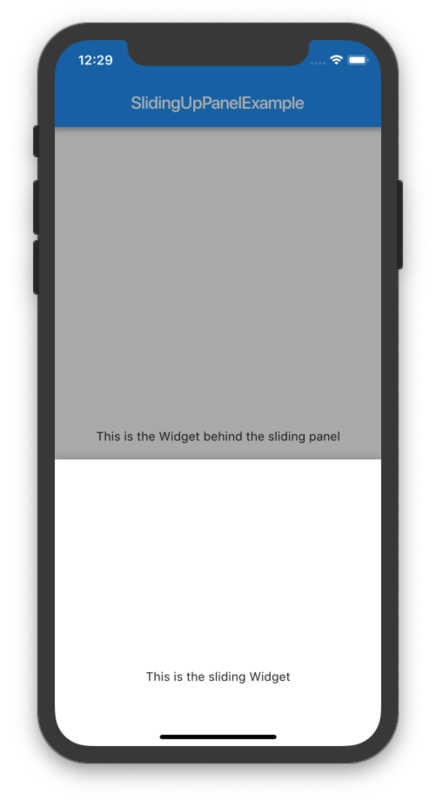 backdropTapClosesPanel Flag that indicates whether or not tapping the backdrop closes the panel. Defaults to true. controller If non-null, this can be used to control the state of the panel. onPanelSlide If non-null, this callback is called as the panel slides around with the current position of the panel. The position is a double between 0.0 and 1.0 where 0.0 is fully collapsed and 1.0 is fully open. onPanelOpened If non-null, this callback is called when the panel is fully opened. onPanelClosed If non-null, this callback is called when the panel is fully collapsed. 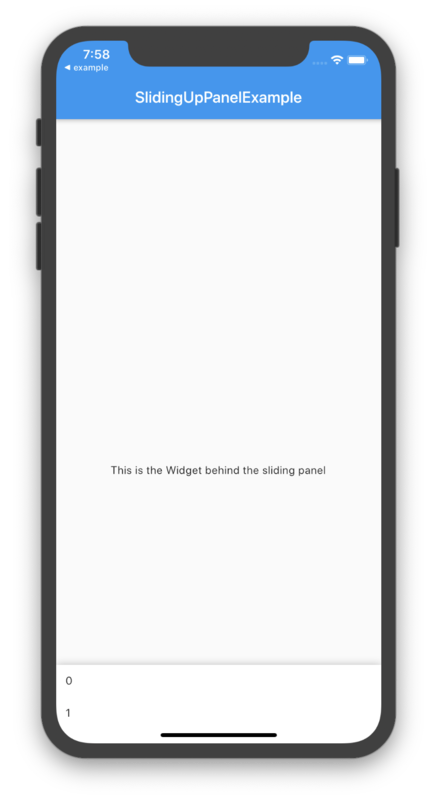 parallaxEnabled If non-null and true, the SlidingUpPanel exhibits a parallax effect as the panel slides up. Essentially, the body slides up as the panel slides up. parallaxOffset Allows for specifying the extent of the parallax effect in terms of the percentage the panel has slid up/down. Recommended values are within 0.0 and 1.0 where 0.0 is no parallax and 1.0 mimics a one-to-one scrolling effect. Defaults to a 10% parallax. 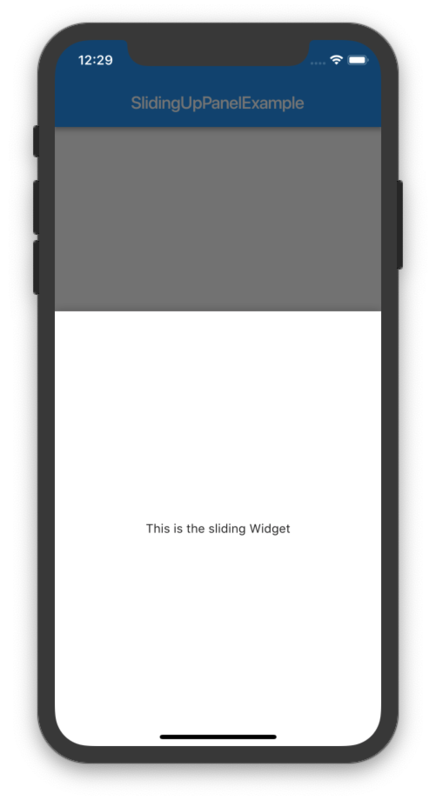 isDraggable Allows toggling of draggability of the SlidingUpPanel. Set this to false to prevent the user from being able to drag the panel up and down. Defaults to true. slideDirection Either SlideDirection.UP or SlideDirection.DOWN. Indicates which way the panel should slide. Defaults to UP. 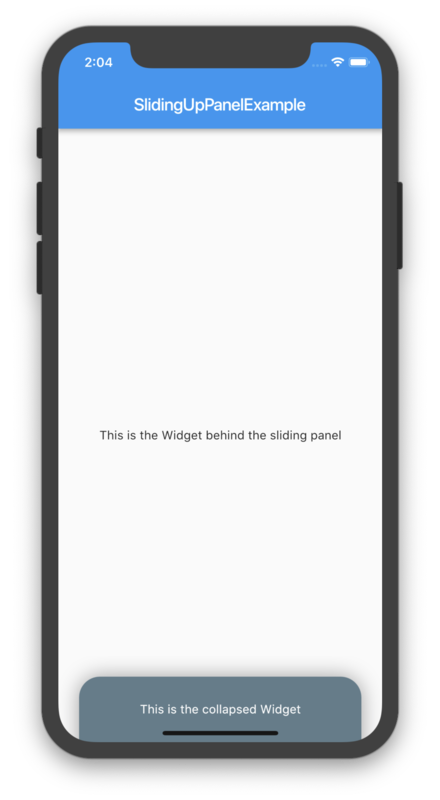 If set to DOWN, the panel attaches itself to the top of the screen and is fully opened when the user swipes down on the panel. Notice how the Scaffold is nested inside of the SlidingUpPanel. This because the backdrop is rendered only over the body of the SlidingUpPanel. As a result, if we want the backdrop to appear over the AppBar, then we must nest the Scaffold this way. Note that a similar effect can be created by simply adding a margin to the SlidingUpPanel. At times, it can be useful to manually change the state of the SlidingUpPanel. This can be easily achieved by using a PanelController and attaching it to an instance of the SlidingUpPanel. Note that since the PanelController modifies the state of a SlidingUpPanel, these methods can only be called after the SlidingUpPanel has been rendered. setPanelPosition(double value) Sets the panel position (without animation). The value must between 0.0 and 1.0 where 0.0 is fully collapsed and 1.0 is completely open. animatePanelToPosition(double value) Animates the panel position to the value. The value must between 0.0 and 1.0 where 0.0 is fully collapsed and 1.0 is completely open. getPanelPosition() Gets the current panel position. Returns the % offset from collapsed state to the open state as a decimal between 0.0 and 1.0 where 0.0 is fully collapsed and 1.0 is full open. isPanelAnimating() Returns whether or not the panel is currently animating. isPanelOpen() Returns whether or not the panel is open. isPanelClosed() Returns whether or not the panel is collapsed. isPanelShown() Returns whether or not the panel is shown/hidden.